NCT offers strong and flexible academic system based on credit hours with multi-level qualifications that begin from Foundation Year, Diploma, Advanced Diploma and Bachelor’s Degree. Each level requires specific grade that is required to proceed to higher levels. This system often challenges students and motivates them to study harder in order to achieve a higher grade that gives them a chance to move to the next level of their studies. NCT offers various courses in Engineering, Business Studies and Information Technology that is designed to meet the national labor market needs of Omani professionals. The student of the foundation program moves to the diploma level in specialized programs after his success in level-four exam (The Final) in English, mathematics and computer. 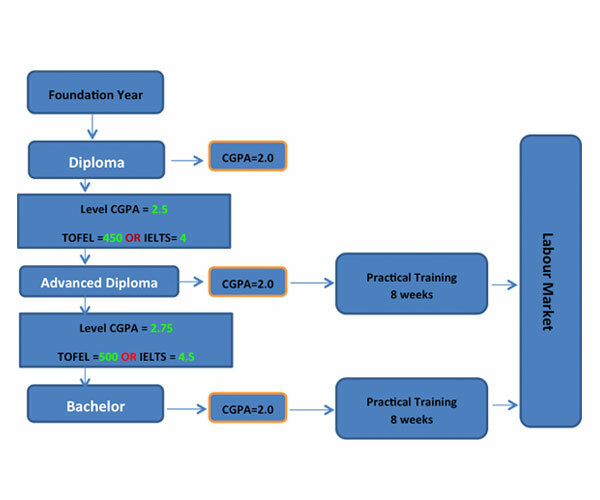 The student moves from Diploma level to level Advanced Diploma in Specialization if achieved the required grade point average (2.5 out of 4) and if presented TOEFL certificate or its equivalent of total points (450) and more or = 4 in IELTS which is a must to be valid before completing the level Higher Diploma. The student moves from the Advanced Diploma level to Bachelor level if achieved the cumulative GPA required (2.75 from 4) and if presented TOEFL certificate or its equivalent of total points (500) or more or 4.5 in IELTS which must be valid before completing the Advanced Diploma level. 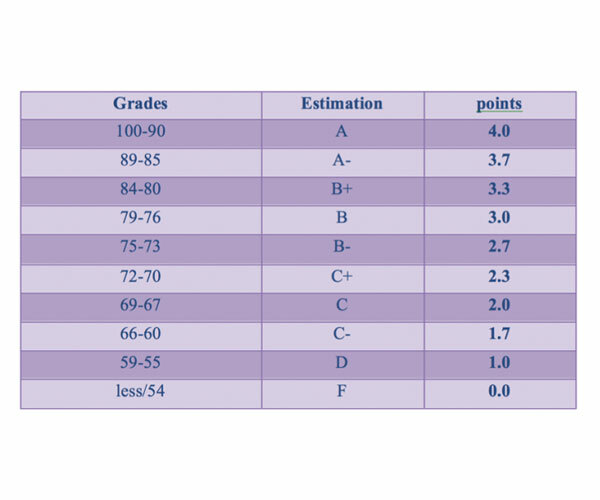 A table showing the conversion of grades to estimate the percentage and points. Grade (C) or higher in all major courses requirements. Grade (C-) or higher in all of the courses of the department's requirements. Grade (D) or higher in all courses of the college requirements. The credited hours is a unit of measurement of a study to determine the weight of courses during one academic semester, and equivalent to a theoretical lecture and one or two practical training in laboratories and workshops and laboratories in the week, and each course of study (three) credit hours. Obtaining the average quarterly rate of points (2.75) to record (18) credit hours for normal semester and (9) credit hours for the summer semester. If the student lacks of there 3 credit hours to complete a level, this allows him to add them to his total credit hours per semester for a total of hours of (18) or (21) credit hours. If the student lacks (3) credit hours to complete the level, and he has to record (6) credit hours in the summer, then he is allowed to add the remaining three hours to the total credit hours in the summer semester so that the total will be (9) credit hours. If the student lacks (3) credit hours to complete the level, and his cumulative GPA qualifies him to move to the next level he registers (9) hours of the credit hours for the next level subjects, in addition to the three approved hours that remained to him from the lower level. And do not enter the credit hours to the subjects of the higher level in the quarterly average or cumulative minimum level account, and is calculated by the credit hours taken by the student from the next level when rates account for this level and after check the conditions to join. If the student has one subject or more to complete the lower level, however, obtaining the estimate (A) in the subjects of the lower level does not qualify him to move to the next level. And the student is not allowed to register for any of the next level subjects. If the student lacks less than (12) credit hours to complete the lower level and his average qualifies him to move to the next level, then he is allowed to record credit hours of the next level subjects provided that the total credit hours from the two levels in the registered course shouldn’t be more or less than (12) hours, except for the summer semester, in which the credit hours do not exceed (9) credit hours.